The new Pizza Hut Big Italy pizza brings back a lot of memories, for me and anyone else that was a fan of the legendary "Bigfoot pizza" from Pizza Hut that was a staple of pizza ordering in the 90's. 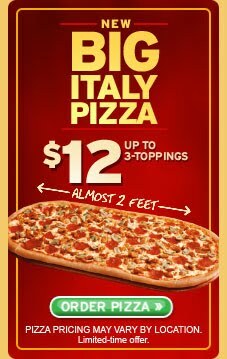 Basically we're talking about a giant sized oblong pizza here, that is cut into square pieces just like the old Bigfoot. When you order you can order the same toppings on the whole thing, or split it up and have different toppings on each side. I went with the classic sausage/pepperoni/mushroom combo on the whole thing since that combo is usually a winner. The delivery took almost an hour, but we're here to review the actual food more than anything. What I got from this is that it's exactly like the Bigfoot pizza, except the crust has a salty flavor to it. There really isn't much else different that I noticed. Personally when comparing the two, I feel like Domino's is usually the better pizza overall, even though it's fairly pricey. I do like the fact that Pizza Hut offers a specialty type pizza that sometimes just fits a certain occasion. Sometimes you're in the mood to just order a giant pizza to add to a good time vibe, and the Big Italy gets the job done in that department.